Here's the lowdown on the World Cup referees. Those to avoid and those who are more lenient. a familiar sight for England players as referee Cuneyt Cakir whips out the red card for Steven Gerrad. Love them or hate them, you certainly cannot ignore referees, the individuals who arguably, have the greatest influence on the outcome of a football match. It’s with that in mind that Sports Interaction has provided what they call the ultimate analysis of the men in black for this tournament. The exhaustive piece of research analyses the performances in international matches of all the World Cup referees and identifies those to avoid if, like Raheem Sterling, you might be prone to the occasional rush of blood to the head. Uzbekistani referee Ravshan Irmatov is the most experienced referee travelling to the finals having officiated in 114 international matches. That’s three more than England’s Howard Webb, who has been in charge for 111 matches and who, despite making a pig’s ear of the final four years ago, has once again received the call-up. In contrast, South American duo Nestor Pitana and Sandro Ricci, from Argentina and Brazil respectively, are the least experienced officials, having refereed only 38 games each before the finals. The less disciplined players will want to steer clear of Mexican Marco Rodriguez. The feared official is known as ‘Chiqui Dracula‘ in Central America for his love of red cards and slick black hair. In 79 matches he has issued 51 red cards – that’s a player sent off more than once every two games. 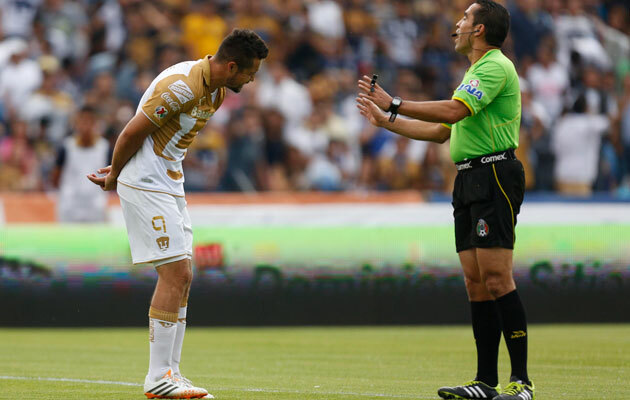 A player cowers before the dreaded ‘Chiqui Dracula’ otherwise known as Marco Rodriguez. As for England, they will be hoping to avoid Turkish official Cuneyt Cakir, who appears to have a particular fondness for sending Englishmen off during international tournaments. Cakir dismissed Steven Gerrard in the World Cup qualifier against Ukraine in 2012, Gary Cahill in the same year at the World Club Cup Final and he was also the man in charge when former Emgland skipper, John Terry, saw red against Barcelona in the Champions League semi-final of 2012. Cakir has already sent off two men on World Cup duty for England, albeit at junior level. Michael Mancienne and Frazier Campbell were both given their marching orders in separate games during England’s 2009 Under-21 World Cup campaign. The most lenient official at the finals is Spain’s, Carlos Velasco Carballo, who sends a player off on average once every ten games. He’s no Graham Poll, though, who achieved infamy in 2006 when he showed Yugoslav defender Josip Simunic three yellow cards in one match. Poll was the victim of much mockery for his oversight, but some referees pay a higher and more painful price for a below-par performance. Take Japanese official Yuichi Nishimura, who will be hoping for an easier time than he received when refereeing a match in the DR Congo, after which irate fans took their revenge by vandalising Chinese restaurants after the game. Geographically, it was close, I suppose. The aforementioned Cakir was once beaten up by a goalkeeper in a Turkish league game, while Chilean official Enrique Osses was knocked out in a match by a disgruntled goalkeeper. At least those incidents occurred on the pitch; spare a thought for Portugal’s Pedro Proenca who was headbutted by an unidentified assailant whilst out shopping in Lisbon. Amid speculation about possible match fixing, the referee you would most want to officiate your team would probably be Sweden’s Jonas Erikkson, whose involvement in a sports TV channel has made him a multi-millionaire. Sports Interaction’s World Cup markets are available here.